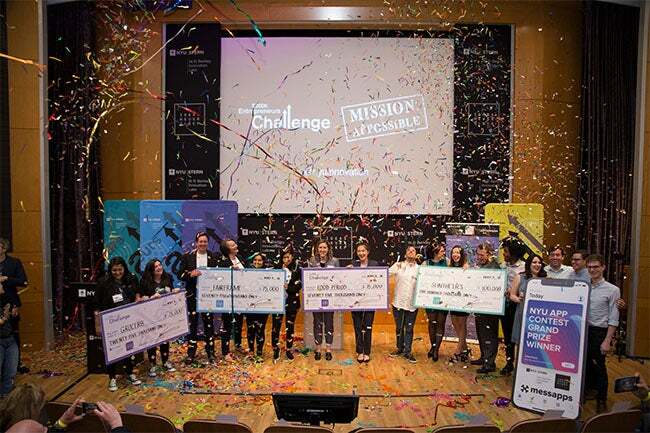 At the conclusion of an eight-month competition, NYU’s most promising innovators received a combined $400,000 in startup cash and valued services at the annual $300K Entrepreneurs Challenge and “Mission: Appossible” mobile app contest, held by NYU Stern’s W. R. Berkley Innovation Labs. The four winning teams were chosen after pitching their ideas and enduring Q&A by judges from venture capital, technology and design, and social enterprise sectors. The $100,000 Rennert Prize, made possible by a gift from Stern Board of Overseers member Ira Leon Rennert (MBA ’56) was split between Grocer8 ($25,000) and Food Period ($75,000). 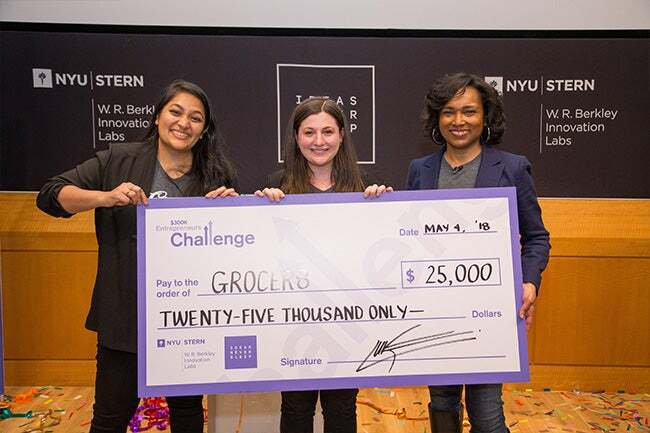 Founded by Stern MBA students Divya Jayachandran and Emily Wallen, Grocer8 is “Yelp for packaged food.” The venture addresses the need for a customer discovery platform dedicated to the taste of packaged foods, as well as a data-driven flavor research tool for food companies. 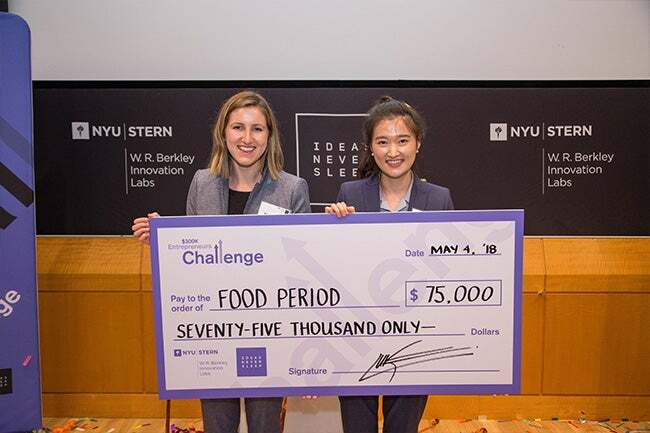 Founded by GSAS student Britt Martin and Jenn Kim, Food Period helps women have great periods, naturally. The company designs functional food products, grounded in nutrition protocols and ancient practices, that improve women's menstrual cycles with the simplicity of a subscription-based service. The $75,000 Social Venture Prize was awarded to FairFrame. 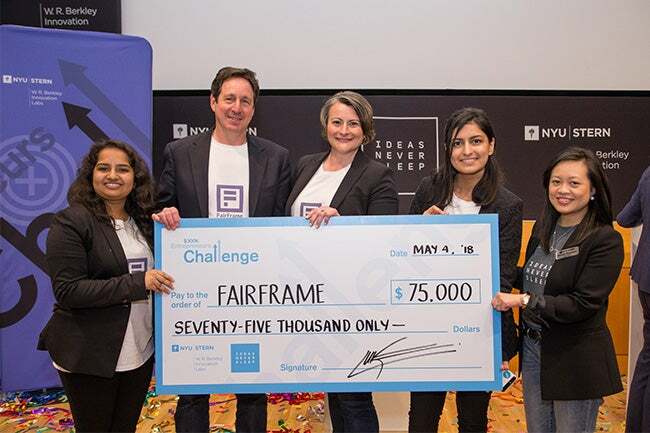 Founded by NYU Wagner Professor and student Amy Auton-Smith, Wagner student Paul Becker, Gallatin student Maham Faisal Khan and Tandon student Vishwali Mhasawade, FairFrame is an AI-enabled language processing platform that helps managers to make informed decisions about people in the workplace and helps organizations to deliver their diversity, equity and inclusion goals. 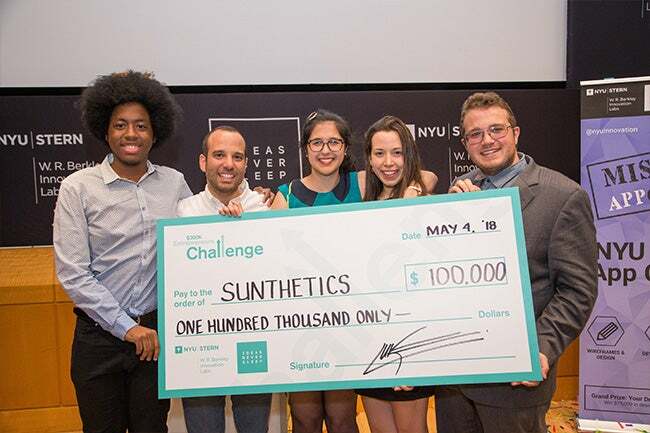 The $100,000 Technology Venture Prize, sponsored by the NYU Innovation Venture Fund was awarded to Sunthetics. Founded by Tandon students Daniela Blanco, Kyle Ireland, Myriam Sbeiti and Benjamin Rizkin, Tandon Professor Miguel Modestino and Sophia Haussener, Sunthetics drives sustainable change in the fashion industry by providing a solar-powered pathway to manufacture environmentally-friendly nylon, while improving manufacturing cost and efficiency. “This year, we saw new ventures addressing a number of business, global and societal issues, from connecting consumers to renewable energy sources and providing nutritious food to consumers, to integrating new technologies to improve retail customer experiences and combating bias in the workplace,” Franklin added. The finalist teams showcased their ventures through brief pitches and explainer videos before an audience of NYU students, faculty and alumni, as well as members of the broader NYC startup community, who voted for their favorite teams. This year, TaQadam, Merciless Motors and Grocer8 received the Audience Choice Awards. In addition, faculty from Stern’s Management Communications Department selected three winners for this year’s Best Pitch Awards, recognizing FairFrame, Food Period and Merciless Motors for their exemplary presentations. In recognition of the critical role volunteers play in mentoring, coaching and judging the teams throughout the competition, Stern alumnus Edward Laganis (MBA '14) received this year’s Mentor of the Year Award, presented by the Innovation Labs’ Cynthia Franklin. The winner of Stern’s Mobile App Contest, “Mission: Appossible,” was also announced: HealthHuddle. 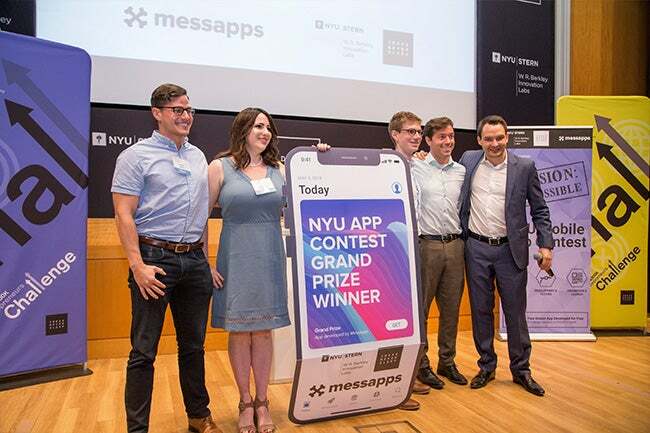 More than 200 entries were received in the third annual Contest, from which five finalists vied for a chance to have their app fully developed by Messapps, a New York-based design and development studio, a $75K value, plus legal services and web hosting. The People’s Choice Award in this year’s Mobile App Contest went to Dalia.